Numicon Kit 2 builds on Kit 1, continuing with the use of Numicon Shapes and Number Rods (to use with Rod Track and Traysincluded in the Kit). 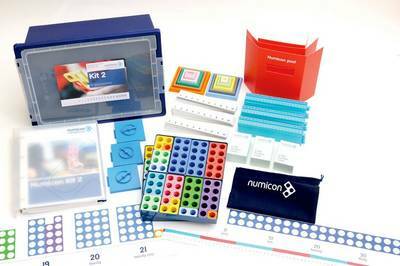 Please note that since so many schools already have these they are not included in the Kit as standard. If you are purchasing a Kit for Home use or the school does not already have Number Rods then these can be ordered seperately. Ideas covered in Kit 2 include: developing further mental arithmetic strategies in + to 100; place value; multiplication; division; and introducing fractions. Suitable for pupils working at National Curriculum levels 2 and 3.